Inspiration We are slackers. Slackers who don't buy textbooks. But in this cruel world, a world in which professors hold no punches on the vocab quizzes, we need a quick fix. What it does QuizSkim takes a pdf link and a page range as input. It then scans the pdf for bold terms, creating a definition for each bold term using natural language processing (context, parsing, etc). 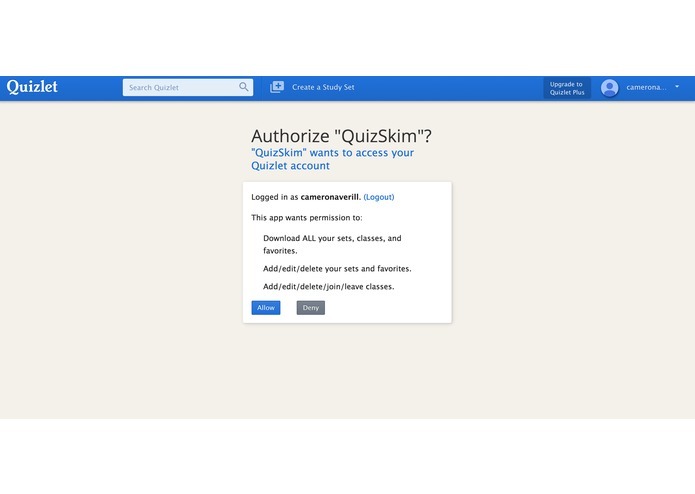 And after QuizSkim generates a list of terms with definitions, it outputs the list to Quizlet for your studying pleasure. Challenges we ran into Detecting bold terms is a lot harder for a computer than a human. Which made us feel a little superior for a few seconds, until we realized we had to teach the computer to find the bold terms. And that was hard. Accomplishments we're proud of Promoting the free education movement, delivering a clean final product for our users.